Is it just me or does Essie rarely announce their LE's? I never seem to know beforehand when they come out with something new.. but it's a nice surprise to walk into the drugstore and see they've come out with new colors - just happened again yesterday. I did not plan on buying anything but I just fell in LOVE with these two colors and could not resist. 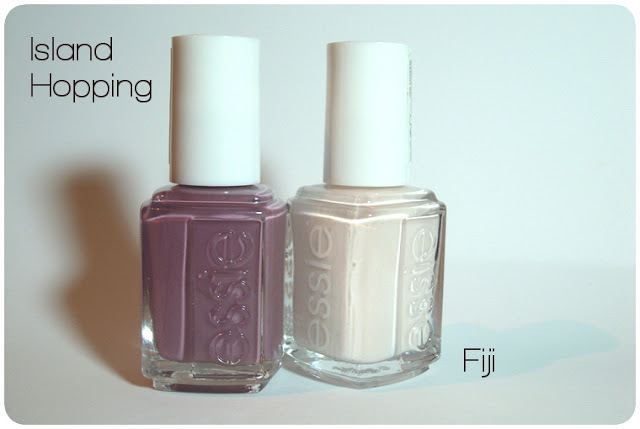 I think the LE is calles 'Best of Fashion', but I'm really not sure.. anyway I picked Fiji and Island Hopping, two gorgeous muted purple hues. Island Hopping is a rich plum mauve with a glossy sheen, which applies really smoothly and evenly. Fiji is an opaque creamy pale pink. Imagine the lightest purple you can, really almost white - pretty! But I was really pleasantly surprised with Fiji because with most colors this light you really have to pack it on, but here it's really wearable with two good coats. I added a third to make it absolutely opaque for the photos but you can definitely get away with two! Island Hopping is awesome this way, too, because it applies so evenly that - even though it won't be opaque - you can absolutely wear one coat only and it will still look great! I love these two, and their amazing quality is a bonus! Beide Nagellacke gefallen mir sehr gut.